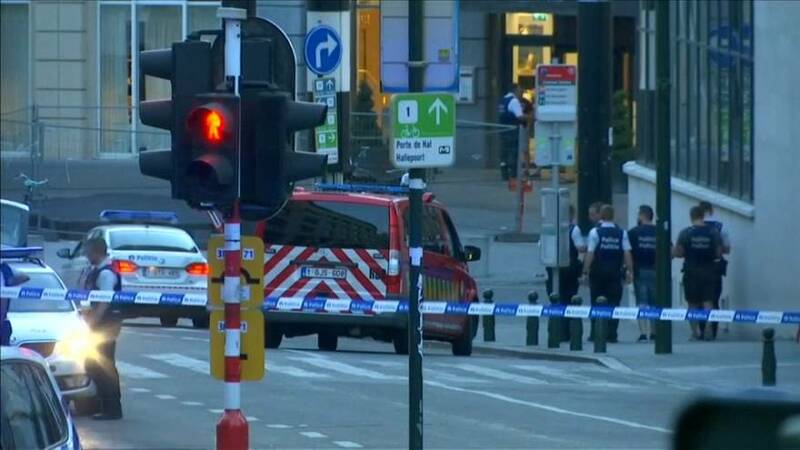 Counter-terrorism police in Belgium are trying to establish the identity of a suspected suicide bomber shot dead by troops in one of Brussels’ main train stations. Witnesses say a man in the platform area underneath the station concourse was shouting, including the words “Allahu Akbar” in Arabic. He detonated a small suitcase he had with him. Officials say he was shot by troops patroling on the scene. No. Smoke billowed through the station concourse, sending evening commuters running for cover. Police halted rail traffic, evacuated the station and cleared nearby streets which were crowded with tourists and locals enjoying a hot summer’s evening in the historic city centre. Brussels’ landmark Grand Place is nearby. Prime Minister Charles Michel convened a National Security Council meeting for Wednesday morning. He tweeted his thanks to the security services involved. Belgium’s national alert level has been maintained at its second-highest level. Belgium has been on high alert since a Brussels-based ISIL cell organised an attack that claimed 130 lives in Paris in November 2015. Four months later, associates of the Paris attackers killed 32 people in attacks in Brussels itself. Since then, further attacks in France, Germany, Sweden and most recently the UK, have been carried out in the name of ISIL. This has raised fears of more violence in Brussels, where almost a quarter of the 1.2 million population are Muslim. “There was a man shouting and shouting and shouting, he was talking about jihadists and all that and then at some point he shouted ‘Allahu akbar’ and blew up the little suitcase he had next to him. People just took off,” – rail worker Nicolas Van Herrewegen was in the platform area. “I think we had some luck tonight. I am happy that no one was injured and that this was basically a failed attempt,” – eyewitness Remy Bonaffe who witnessed the explosion. “We consider this a terrorist attack,” – prosecutor Eric Van Der Sypt told reporters. “Such isolated acts will continue in Brussels, in Paris and elsewhere. It is inevitable,” – Brussels security consultant Claude Moniquet told broadcaster RTL.